Champion swimmer Michael Phelps and his growing family continue their partnership with Colgate this fall to inspire 10 million kids and teens to turn off the faucet when brushing because #EveryDropCounts. If embraced by 10 million youth, turning off the faucet could save approximately 80 million gallons of drinkable water each day. Starting on World Smile Day on October 6, 2017, this youth-focused campaign began engaging kids and teens during Campus Sustainability Month with the Association for the Advancement of Sustainability in Higher Education (AASHE) and TerraCycle. In addition to turning off the faucet while brushing, kids and teens can spread awareness using #EveryDropCounts on social media and by learning more at EveryDropCounts.Colgate.com. Held every October, Campus Sustainability Month was founded by AASHE to raise the visibility of sustainability. Throughout the month, colleges and universities organize events to inspire and engage incoming students and campus stakeholders to become sustainability change agents. Long-time sustainability partner of Colgate, TerraCycle is a global leader in innovative recycling programs helping to recycle nearly three million pieces of oral care product and packaging waste from more than 19,000 locations as part of the Colgate Recycling Program. 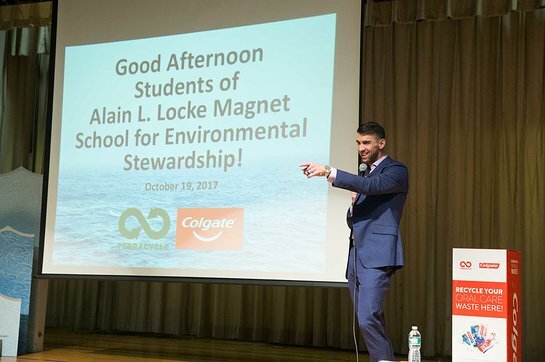 On October 19, 2017, Michael Phelps, Colgate and TerraCycle CEO Tom Szaky, visited a top participating school in the Colgate Recycling Program, the Alain L. Locke Magnet School for Environmental Stewardship, to talk about water conservation and how #EveryDropCounts. After spending the day teaching water-saving tips and tricks, Michael Phelps gave the elementary students each a water-activated drain sticker to apply to their bathroom sink as a visual reminder to “Turn Off the Faucet.” These stickers will be further distributed to 30,000 students who are participating in TerraCycle’s recycling efforts with Colgate households when they pledge to turn off the faucet. Each pledge represents a savings of up to eight gallons of clean, drinkable water daily. As Michael Phelps and wife Nicole await their second child, their family continues to strive to set an example for the next generation. “Boomer is about to be a big brother. 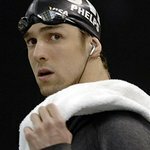 If we set a good example for him, he too can be a good example for his little brother or sister,” said Phelps.